With more than 70 % of our Earth covered by water and nearly half of our global population living near the coast, the importance of water on Earth cannot be underestimated. Every living organism needs water to survive. In the past decades, we have made progress in deriving water quality information by analyzing imagery taken by drones, airplanes or satellites. Monitoring water from a distance allows you to see the bigger picture at a glance, unravelling spatial patterns and dynamics that are not noticeable from the ground. This is a significant benefit when combined with current in-situ monitoring practices that often measure at a limited set of fixed locations only, with buoys or from piers. On top of that, a long time series of EO data (some dating back to the 1970s) is available, so you can see how an area has evolved. Typical water quality products show suspended particulate matter concentrations, chlorophyll concentrations, or presence of algae blooms. Another major topic is keeping an eye on the coastal environment health and monitor the coastal resilience against extreme events like storms and hurricanes. In many cases, coasts are of natural origin with beaches and dunes, coral reefs, mangroves, but sometimes they are man-made with a large population living near the coast. Thanks to Remote Sensing, the coastal area can be monitored to assess the health and integrity of the area and to prevent catastrophic flooding of cities and loss of lives. Coastal zones, inland lakes, estuaries and rivers have a large potential for different uses. Just think about the creation of artificial islands for ecological recovery, the installation of wind turbines for energy production, aquaculture, etc. By using the right remote sensing solution, the impact of such installations on the environment can be monitored. 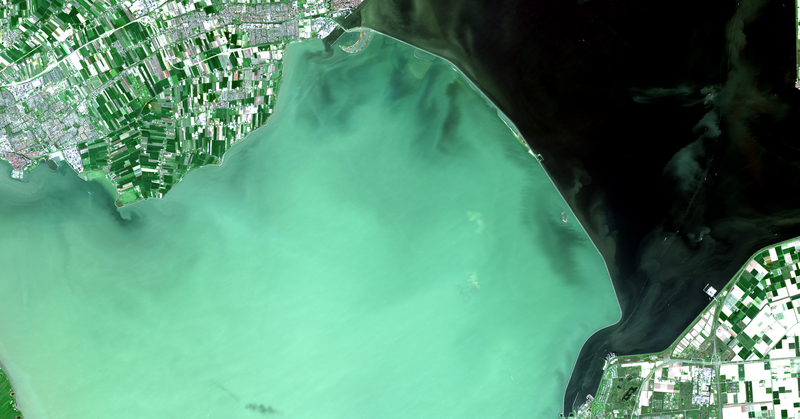 Sentinel-2A images of lake Marken, the Netherlands taken on 21 April 2016 (above) and 8 September 2016. At lake Marken a swamp area named ‘Marken Wadden’ is currently under construction in the eastern part of the lake to improve the ecology of the lake. 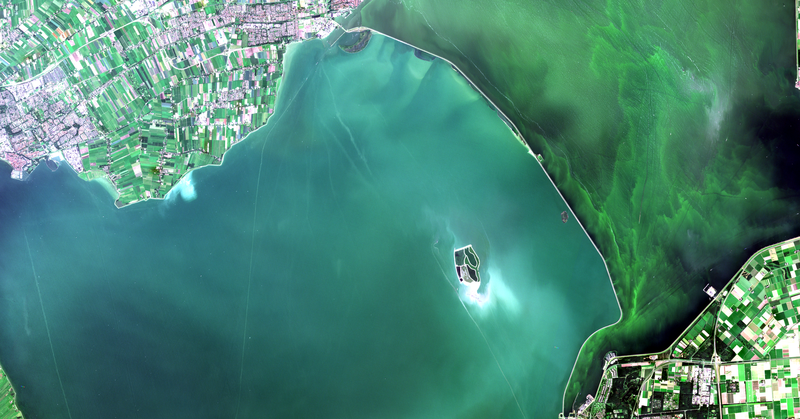 With remote sensing you can clearly see the creation.